Shea Butter comes from the nut of the African shea tree and has been used for years to soften and retain moisture in hair. Shea butter is also a nutrient powerhouse for the hair. It contains vitamins A, E and F and has healing properties that pertain to the scalp. One thing to remember with all the recipes below is to always use shea butter on damp hair, and it is almost always used as a leave in conditioner, although it can be used as a pre-conditioner before shampooing. Melt shea butter and coconut oil in microwave at 15 to 20 second intervals until fully melted. Add remaining ingredients to the melted shea butter. Leave in the freezer for 5 to 10 minutes or until hard. Making your own hair conditioner is easy. All it takes is shea butter, essential oils and some time. 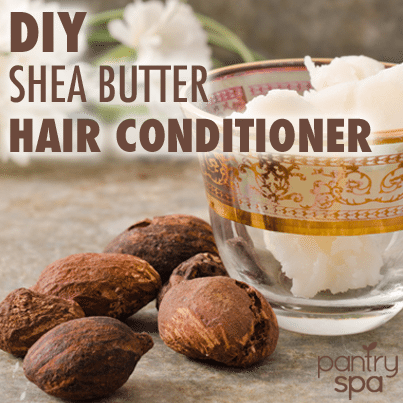 Check out these shea butter conditioner recipes. Use a double boiler to melt the coconut oil and shea butter together. Remove from heat after melted and add the sweet almond or oil of your choice. Place the bowl in the freezer until semi-hard, then remove and whip until the consistency is firm. Stir in your essential oils and vitamin E.
In a measuring cup, combine the oils and shea butter. Microwave in 30-second intervals until everything is melted. Then add vitamin E and essential oil. Prepare an ice bath and place the measuring cup inside. Use an immersion blender to whip the ingredients. Mix until the consistency is where you would like it to be. The more you mix, the thicker it will become. Make sure the shea butter is soft and then mix with an equal part of conditioner. Add in a half part oil and mix well. Allow to cool and harden. Apply a pea sized amount to your ends. It may feel sticky at first but as it stays in the hair it becomes less sticky. Melt the shea butter in a double boiler and then add the olive oil. Stir. Add in the honey and the Greek yogurt and stir until all the ingredients are evenly mixed. This recipe should help with hair growth and should be used the same way a deep conditioner is used. This might be useful, if half your instructions weren’t missing! I’d be very interested in making the whipped conditioner if you want to repost instructions! What do I do once the whipped shea is hard after it’s been in the freezer?